at "How Sweet the Sound"
Tea sets are one of my favorite collectibles. I have sets from miniatures to my favorites I rotate and display throughout my home. I have several sets by Laura Ashley. This service has a pink border with several shades of petite pink flowers. My husband knew how much I liked this set so he surprised me and gave it to me one year for my birthday. Most of my Laura Ashley sets were made in the eighties. 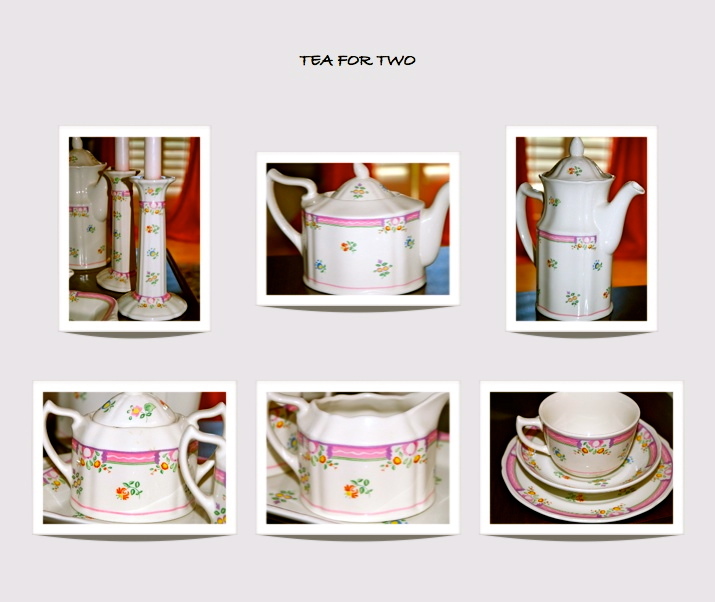 So for Happy Pink Saturday I'm sharing my pink and white Laura Ashley Tea for Two set in the Alice pattern. I am getting ready for a weekend with family and friends. The house will be full with everyone coming and going so I want to have a place for cozy chats with a cup of tea or coffee. I decided to use the tea table in the living room in front of the sofa. I love to have everything planned ahead so I can enjoy my guests. Now when we are ready to slip away for girly time all I have to do is prepare the hot beverages and slice the cake and we're ready to enjoy our special time together. Happy Pink Saturday! I love your pretty tea set! 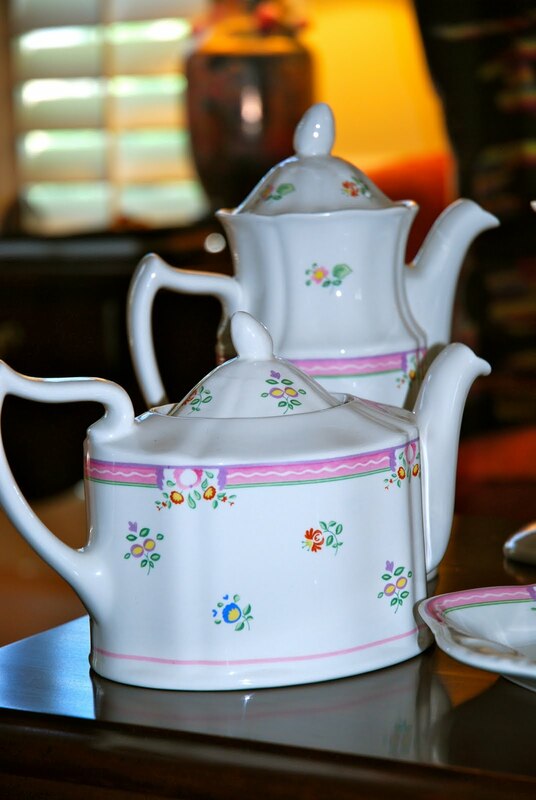 Such a pretty tea set - they are so feminine and inviting. Congratulations on being the featured Pink Saturday girl. Yes, Emily, my dogs are springer spaniels. I am sorry about Bentley...they really are family. What a lovely tea set. You shared a very nice post on your featured Pink Saturday. Wish I could join you for a cup of tea using one of these pretty cups. Hi Emily...I love your blog! First of all I would like to help myself to a cup of tea & some jam from that gorgeous hutch of yours! What a lovely tea set you featured. Hi Emily, I loved reading your featured post on PS. Like you, blogging was so much more than I ever dreamed it would be. It is a pleasure to meet you. Your tea set is beautiful in pink. What a wonderful gift from your dh. The pieces you have are so special. I know your family and friends will be entertained in a very lovely way. I adore your tea set. Hi Emily...nothing says Happy Pink Saturday like a pink teaset....very pretty. I really envy that tea-set -- yeah, I know it's not nice to envy. I am only human. Emily, your dishes are awesome, so springy & elegant. There is nothing like the English inspired florals to delight an event. I can tell you adore England as I do. I tell people I am a displaced anglophile. I adore it across the pond and would move in a New York minute. It is heaven on earth. I have bought many LAshley dress over there through the years, and I still am wearing many of them. I love everything LAshley. Thanks for a lovely post. Happy Pink Saturday. What a gorgeous share today. I love this beautiful set of tea for two. Momma and I always say if we only had time for tea. I am going to have to get a little set for her when I go home in the Fall. I know she would love the idea of a service just for two. Your L.Ashley tea set is so lovely! I know your company will love to use it this weekend!! It was great to have you as the featured blogger this week!!! Happy Pink Saturday! Your pink tea sets are beautiful and so is your blog! I am sitting here imagining that Jane Austen would sip tea from this. I am having a Jane Austen phase LOL. Hi Emily, Happy Pink Saturday! Your blog and photographs are beautiful! I love all your beautiful dishes, you must have quite a collection! How lucky of you to be such world traveler, I would love to go back to France again! Congratulations on being freatured on Pink Saturday. Your tea set is beautiful. I enjoyed my visit to your blog. Lovely tea set. Congrats on being featured on PS. Have a blessed weekend. Hi, Emily!! I'm delighted to find your blog through Pink Saturday!! I love French faience, and all things French, and it will be fun to read through everything and explore! The Laura Ashley tea set is lovely! Perfect for your guests. Whatever happened to Laura Ashley? I had a wonderful blouse of hers in the '80s. I love Laura Ashley! I shop at her shops whenever I am In the UK. That's a lovely set! What a charming tea set! How fun to collect them. Happy Pink Saturday! Happy Pink Saturday as a featured blog! It is so nice to meet you! I love your Laura Ashley china. It is so feminine and dainty. I love not only the pattern but the style as well! How lovely that your husband gifted you with this!! Have a wonderful Pink weekend! P.S. Congratulations on being featured today! Happy belated Pink Saturday. 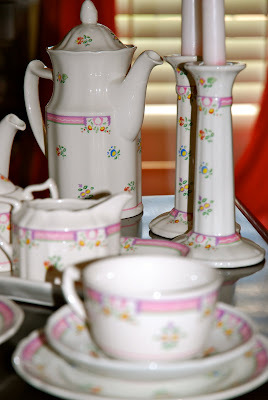 That set is very whimsical and fun with the cherry pink and the cute flowers. I know you must smile each time you use your plates. The candleholders are my favorite pieces in the set. Enjoy the rest of your weekend! Oh, this set is just so pretty! Absolutely lovely! This is a beautiful tea set! Laura Ashley was one of my favorite designers. It would be lovely to be a guest and sit down to a set like this. Happy Pink Saturday, Emily. I hope you enjoyed being the featured participant. Everyone loved you and your blog. Thank you for sharing with all of us, and for making Pink Saturday special. I hope to see you at our birthday celebration this week. It is always fun to see what everyone posts for the big day. Your tea set is so pretty. I have always loved the Laura Ashley style, and this is a gorgeous representation of that. A lovely tea set. The table is all set, just need the guests for an enjoyable time. Love your pink tea set and your beautiful blog. Thanks for visiting and leaving your sweet comment. Come back again! What a very pretty pink post. What a fabulous tea set. Thanks for sharing with my newbie party. I love your tea/coffee service set. I too adore tea sets and wish I had more of them....LOL! The colors of this one are gorgeous. Have a wonderful week! What a pretty tea set - I've never before seen that pattern. Hi Emily, I love your tea set. I'm a big fan of tea but I'm embarrass to say I have my tea in a mug! Thanks for visiting my blog, your friend will also be in my prayers. Hi Emily, love your tea sets. I also have a few and one of my favorites is a "Peter Rabbit" set I bought when my daughters were young. I display them in my china cabinets. And going to a High Tea is one of my favorite things to do at Christmas time or when I am traveling. Hope you had a wonderful weekend with your family and lots of cozy tea time. Yes, this is such a pretty pattern! It is fabulous that you have the whole set. How sweet too to have ready a beautiful tea setting and dessert for your family and friends. Beautiful Laura Ashley tea set. I love anything made by Laura Ashley. Just gorgeous! Your gift from your hubby is just stunning! I'm in love with it, each piece is gorgeous! Thank you for coming and leaving me such lovely and generous comments! This tea set is just gorgeous....So pretty and pink! That is a beautiful set. Love the colors. I'm a little late in visiting. Love the tea set - how sweet of your DH. Tea can be such an Event!